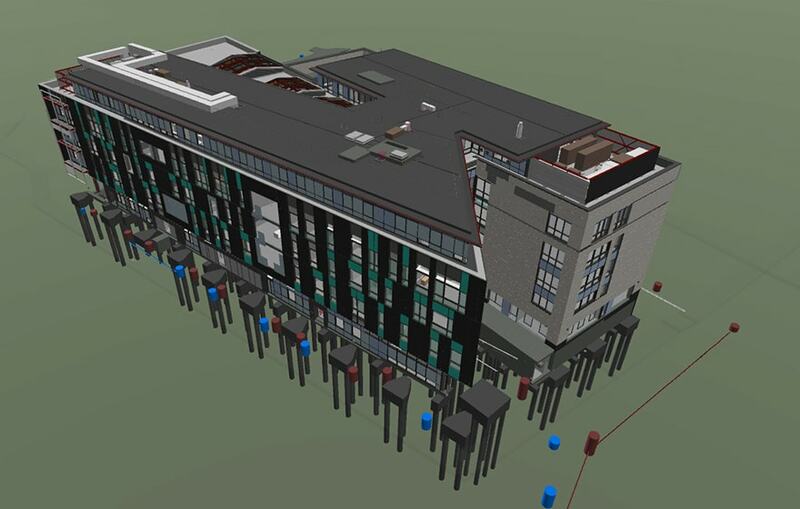 In the past 12 months the University of the West of England In Bristol has been pioneering the use of BIM Level 2 for its capital building programme and asset management using real-time issue tracking tool Revizto. Here, Mike Ford, digital/BIM manager at UWE, talks about the challenges and successes that helped the UWE win BIM Project of the Year in the 2018 Construction Computing Awards. Tell us a bit about UWE’s estate programme and how new technologies like BIM fits into that? As an owner-occupier BIM makes a lot of sense for a university. Consider all the information that the organisation needs if it is to manage its facilities in line with best practice. The organisation has always had ambitions of having accurate graphical records. These have always taken the form of two-dimensional drawings and success has mainly been limited to the building fabric. These plans have been used for a plethora of applications, from space management projects to refurbish and alter space through to emergency evacuation plans. The university regularly failed to keep up to date electrical and mechanical layouts. This has led to many issues, particularly when projects seek to alter a space. This also extends to knowing if airflow is sufficient for the number of people in a room; finding a water valve in the event of a leak; and understanding which circuit the lighting in a space is connected to. The university has also struggled to keep accurate records of assets, this has made maintenance of them far more difficult. Sourcing a term maintenance contractor was the catalyst towards changing the way assets are managed. It is difficult to appoint a contractor to maintain an undefined quantity of assets in undefined locations. The result of not knowing this information is a great deal of risk being priced into contracts. The maintenance contractor would have to undertake their own asset survey and produce their own maintenance schedule if the client does not supply one. Not only is this hugely labour intensive but the information is not available until post contract, when the survey is completed. BIM has the capability, once linked to CAFM (Computer Aided Facilities Management), to solve many of the problems faced by the estates department. Not only does it solve the immediate problems but it brings many additional benefits. 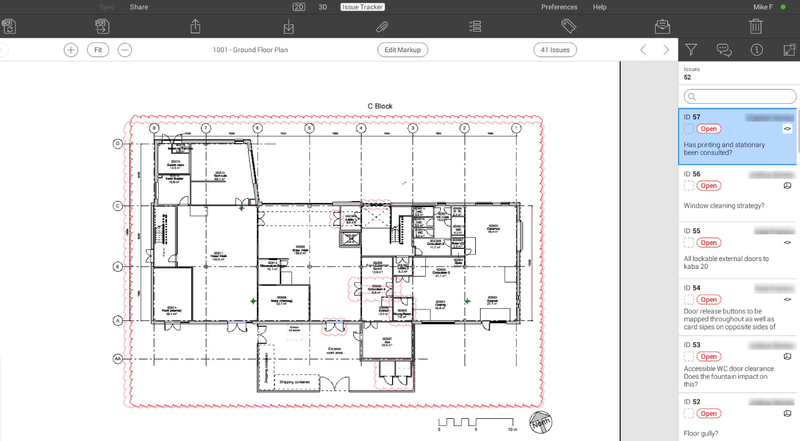 Are you using BIM for asset management? And what has been your experience of that? Yes – it’s the right solution and the theory is sound. The reality isn’t as easy to achieve. There are many technical barriers to overcome and the model completeness and information quality needs to be close to 100%. The BIM model is the foundations on which we will build value. The problem is contractors have, in the past, tried to deliver us “surface level BIM”, the bear minimum they feel they can get away with to tick the BIM box, the foundations without the reinforcement. If you try to build value in the FM world on poor foundations, it’s not going to stand up, the higher you build the greater the risk of collapse. For me, using BIM in FM is all about good data management and creating strong and clear contractual documentation about what information you need delivered. Why do you think clients are reluctant to do that? It’s not easy, there’s no value to foundations until the building is constructed and that’s some way into the future. We’re simply not used to managing information on this scale and complexity. We also need to collaborate at a much greater level, the mantra is the “single source of truth”. We must share information and every small step we take, we have to ensure that information has the maximum value. I’ve been to FM events where everyone seems to just want to sell/buy a dashboard that will answer all their problems. The dashboard is less than 1% of the effort, the data behind it is the elephant in the room that no-one seems to want to talk about. What was the catalyst for adoption of BIM asset management? Two things were happening at the same time, the appointment of a new term maintenance contractor had drawn a lot of focus onto the need for accurate asset data. This led to the implementation of the Archibus CAFM system. At the same time UWE was ramping up to an unprecedented period of creating new buildings and facilities as part of its master plan. Some forward looking members of the estates team had included a requirement for BIM Level 2 on the contract documentation. For a long time, the BIM requirements of the project were only very loosely managed by the estates department, we put consultants in place to manage BIM. It was not until the roof of the building was being installed that UWE’s, at this point untitled (as they are in other roles), BIM manager and CAFM manager attended a Soft Landings meeting on BIM in the site cabin. The good thing is that we realise that BIM can hold a lot of benefits but we also realise we’re asking for the wrong information. Using a schedule of assets that had been created by UWE’s maintenance team and a number of meetings, we produced some asset requirements and produced an AIR (asset information requirements) document. Then, using the Ministry of Justice BIM documents as a template, we rapidly produced an EIR (Employer’s Information Requirements) document for the university. At the same time our architect’s BIM team had changed, following the departure of their BIM manager. In what can only be described as a tremendous feat of collaboration, we found a mutually beneficial route forward. We dropped the UWE customised asset list in favour of the new AIR which had been aligned to standardised Uniclass product naming and COBie field naming (although UWE did still need some custom fields). From an architectural point of view the project then went very well. There was a lot of engagement and UWE got the asset information it required. There was also much learning on both sides. Unfortunately, this wasn’t replicated for the MEP. The MEP engineer had chosen not to follow the BIM workflow and instead tried to produce a handover model at the end of the project. It has been a very painful process to get to the point we are now at – over a year after handover the main contractor is conducting a full survey of the building to update the model. 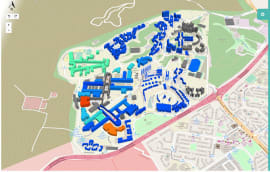 UWE has been using Revizto on their five active projects, including the two largest – Bristol Business School (£55m) and The Engineering Building (£45m). We have now learned from the earlier projects and vastly improved the processes and contract documentation. The “single source of truth” mantra has been proven time and again – anything that breaks this rule seems to end badly. When every time you have two standalone sets of information, or data silos as we call them, you are open to risk. In the graphical realm, 2D drawings have inherent issues, it’s not possible to describe something in a three-dimensional location on a single two-dimensional drawing. To describe the position and height of a duct, you always need at least two drawings, such as a plan and a section. The same is true for asset data, having drawings that show assets existing separately to the asset list is dangerous, someone could delete an asset on a drawing but the asset list won’t update itself. This creates two conflicting sources of information. This is why BIM has been put at the heart of the estate’s strategy. Asset data and model checking is carried out by our internal BIM team at RIBA Stages 4 and 6. When the design has sufficiently developed members of the estates FM team conduct a walk-through of the model and assess the maintainability of the design. We call these CDM Walk-throughs. Using the stage 4 data export, the maintenance plan is generated for the building. Using a combination of Uniclass product codes aligned with SFG20, we can quickly understand the amount of resource that will be required to operate and maintain the building. During RIBA Stage 5, the model is used on site by both the contractor and the UWE appointed clerk of works/NEC supervisor. UWE provide licences to mobile model viewing software (Revizto) to enable this process. At handover the O&M sections are linked to their modelled elements. This allows maintenance staff on site to quickly access relevant product and safety information by clicking on elements in a 3D environment on a tablet computer. The model is linked to the Archibus CAFM (computer aided facilities management) system. This allows for the management of reactive, planned and condition-based maintenance works at an asset level. The O&M information also connects to the CAFM system as the hyperlinks are data held in the model. Now the CAFM system can be used as an index for accessing O&M information as well as using the model. As time progresses the models are maintained by the estates team and the graphics and data are used for a range of operational, academic, marketing and maintenance tasks. It’s taken a lot of effort to get this process in place and there have been challenges. BIM often comes under attack when a project is value engineered. There is an industry-wide problem whereby our melioration bias leads humans to give more attention to outcomes that are more certain and immediate, such as those of capital expenditure over those of operational costs. We’ve not come close to reaching the finish line. Where new builds have run through all of the above-mentioned processes correctly, we have fantastic information. The issue is, we have a supply chain not set up to deliver information to the levels that we want to achieve. Some projects have failed, either falling victim to value engineering or the contractors being in breach of contract, leading to long and drawn-out negotiations. There is also more work to do upskilling our internal teams and maintenance personnel. Just giving someone all the information they need to do a job remarkably efficiently doesn’t mean they know how to use it. The journey into the digital era is ironically not as simple as flicking the digital switch, but each success paves the way to the next. There is value in BIM, though frustratingly it often comes in the form of anecdotes about the mistakes that weren’t made due to the modelled information. It would of course be much better if BIM could be summed up in the number of pounds saved – however, how do you go about valuing the intangible? What we can be absolutely clear about is the university now has far better asset information than it did in the past. Perhaps we will see the cost of our maintenance contract reduce the next time it is tendered as we can now remove a large portion of risk. The process is very simple but it makes a world of difference to the quality of models being handed over for use in maintenance. We have learned from previous projects that the implementation of model issue management technology is critical as soon as the models begin development. BIM defined in the project brief with the use of model issue management strategy. UWE floating licenses are distributed to key members of the project team as well as internal members of the estates team (stakeholders) who have a particular interest in the design of the building (Building Service Engineers etc). Design Review Workshops (using Revizto) are run with the project and client teams during RIBA Stages 3 and 4 to allow the client to make changes to the scheme at the earliest possible point, minimising the cost of change. 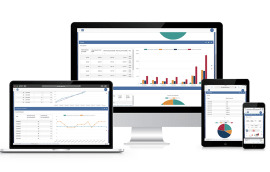 The project team utilise the model issue management platform between themselves to aid the development of the models. 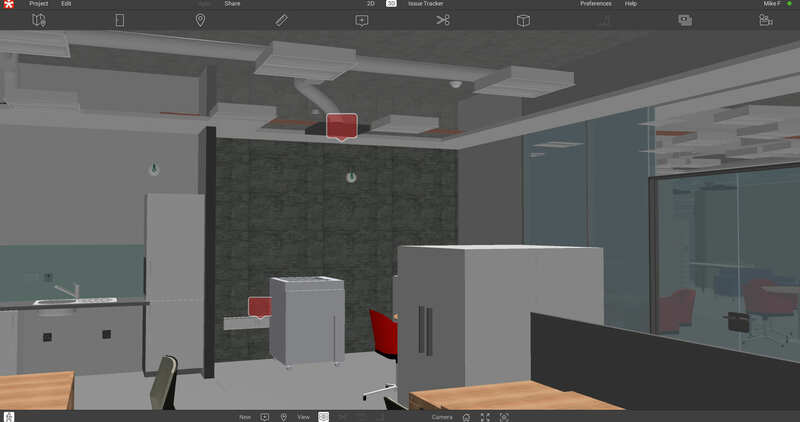 Clash detection via software such as Navisworks can be added to the Revizto platform to ensure the model is being coordinated in one central location. Interim asset data and model checking is carried out by our internal BIM team at RIBA stages 4 to 6 to ensure the model is progressing at an adequate level and achieves the required LOD. Where non-compliance is identified by either the project or UWE team; reporting of the errors is easy through the platform via issue management assignment. This tracks the current status or the error from “open”, to “in progress”, to “solved” and “closed”. This allows us to track the amount of outstanding actions all the way up to handover of the models. When the design has been sufficiently developed members of the estates FM team conduct a walk-through of the model and assess the maintainability of the design. We call these Virtual CDM Walk-throughs. During RIBA Stage 5, the model is used on site by both the contractor and the UWE appointed clerk of works / NEC supervisor to track model and on-site progress. Pictures can be uploaded, capturing each individual error, which will assist in ensuring the model reflects the as-built environment. The trusted model (due to the rigorous process before) is linked to the Archibus CAFM (computer aided facilities management) system. This allows for the management of reactive, planned and condition based maintenance works at an asset level. 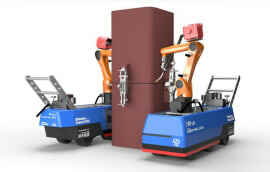 Once UWE take ownership of the models the licenses are transferred from the project team to the maintenance contractors. The maintenance contractors can then use the issue management tool to track changes to the building with pictures that allows the BIM Team back in the office to keep the models up to date. The CAFM system is updated in tandem with the models through bi-directional links meaning the single source of truth is constantly updated and maintained. It’s taken a lot of effort to get this process in place and there have been challenges, mainly getting everyone to use the software platform on a day-to-day basis. Rhys Lewis, Revizto business development director, UKMEA & Europe, on how he sees the digital construction agenda developing. Are you seeing barriers to BIM take up reducing, and what would you like to see change? I certainly see the barriers now starting to lower at least. This seems to be coming mainly from confidence in seeing what others are doing and also gamification of BIM which helps engage the whole project team. Seeing what UWE are doing with Revizto is making others listen, engage and want to benefit from this themselves. What are the main challenges as you see them to digitisation of construction? The way contracts and scopes are set up are probably one of the main reasons for this hold up. Another big challenge for us as an industry is people, and resistance to change. However, these barriers are slowly lowering and there is clearly a light at the end of the tunnel. 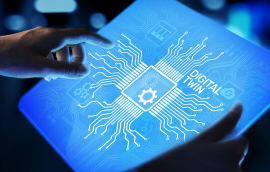 I certainly feel and see that our technology is a helping hand in this process in the large variety of projects we’ve being invited to lead as the project coordination and digital collaboration platform. What’s next for the company? For Revizto delivering what our clients ask of us is our number one priority. Being aware of what the industry is asking for with a lean and dynamic approach to deliver innovation is what keeps us ahead of the competition. Every release includes improvements and additional features which are all led and steered by our premium users, this is critical. Listening to what your audience want and not simply guessing has been a real positive approach for our team. Our latest release now includes point cloud support, an amazing achievement that has received so much positive response. 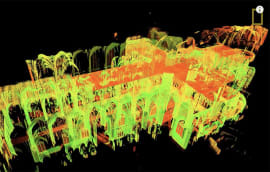 Having the ability now to view a point cloud, alongside a 3D model and align your 2D drawings automatically, all on a mobile device, is an industry first. We also have a very healthy development roadmap with lots planned and much already underway so watch this space.